King Philip's War Summary and Definition: The King Philip's War was a bitter and bloody conflict between the Algonquian speaking Indian tribes and the English settlers of the New England colonies, which took place from June 1675 to August 1676 ending in victory for the colonists. More than half of New England's 90 towns were assaulted by Native Indians. 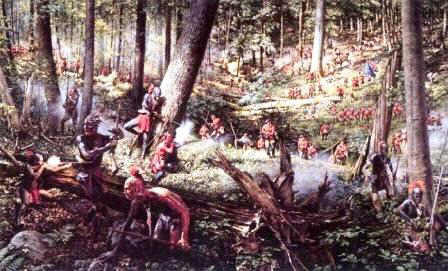 During King Philips war almost one out of every twenty people in the region, both whites and Indians, are killed. Over 600 colonists and 3,000 Indians were killed during King Philip's War and Indian captives were sold into slavery. Facts about the King Philip's War - Why was Metacom given the Name King Philip? This short History Timeline of the King Philip's War provides fast facts and information about the history, years & dates, key events and famous people who fought in the King Philip's War. 1661 The death of Chief Massasoit. 1676 August 12: Metacom (King Philip) is betrayed by an Indian informant in the service of Captain Benjamin Church revealing his hiding place at Mt. Hope in Rhode Island where he was killed. King Philip's War. Discover the key years, famous people and events of the King Philip's War together with the causes and effects of King Philip's War. Pictures have been include wherever possible which show the battlefield, clothing and weapons of the Native Indian tribes and their leaders who fought in the King Philip's War. We have included pictures and videos to accompany the main topic of this section - The King Philip's War. The videos enable fast access to the images, paintings and pictures together with the information and the many facts featured on this subject of the King Philip's War.